After selecting the SEPT product, you want, click on BUY and the system will transfer you to Techstreet store that does the fulfillment process for SEPT.
3. Minor revisions to over 40% of the standard. IEC 62304:2015, is often confusing and laborious. This is because directions contained in the standard can seem unclear or ambiguous. To aid in determining what is actually required by IEC 62304, the experts at SEPT have produced a checklist. This checklist was prepared by analyzing each clause in IEC 62304 for key words that signify a required policy, procedure, plan, record, document, audit, or review. To better understand this model a user of this product should understand SEPT definition of an auditor. An auditor can be your boss, an inside auditor or an outside auditor such as the European Union, FDA or a prime contractor for your product. The checklist will give the auditor and you a common reference point in the standard (Clause number) that becomes the index point for physical evidence. If a standard calls out physical evidence more than once , such as a "training plan" it is always index to the first clause that reference the training plan This method will allow you to organize you physical evidence in a systematic manner for presentation to the auditor. This simple checklist allows you to bring the document down to simple terms that a professional lay person can understand (policy, procedure, plans, records, documents, audits and reviews). The checklist is available in PDF or word format. The latter format allows you to tailor the document to your business case or the media that your organization wants to use the checklist in such as excel web page format or any other end product type in order to meet compliance with the standard in the most efficient way possible. The checklist comes with 4 hours of free consultation, from experts that have firsthand knowledge of the underlying standard, to answer questions on the standards and checklists and is valid for 60 days after purchase of the product. Stay compliant with ISO 13485:2016! 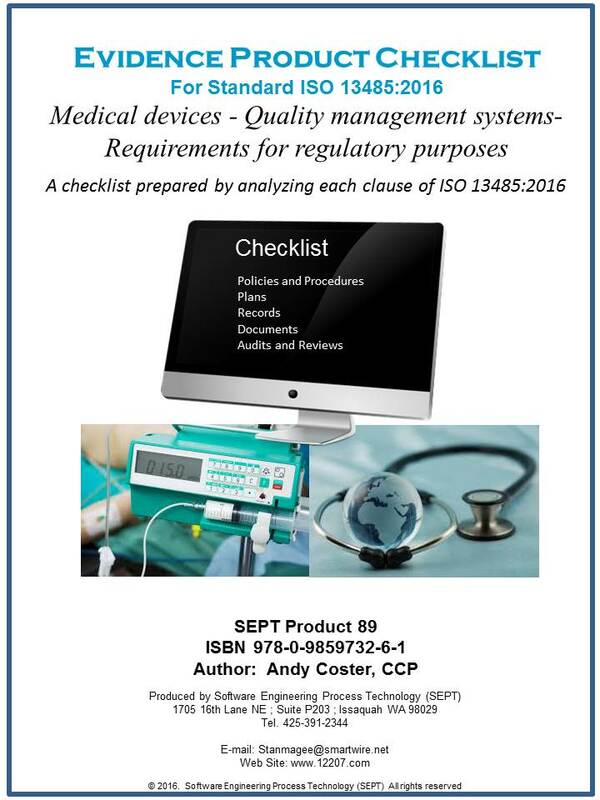 This is a Checklist for ANSI/AAMI/ISO Standard 13485:2016 Medical devices - Quality management systems- Requirements for regulatory purposes ISO 13485. This standard is a requirement for all medical devise producers. 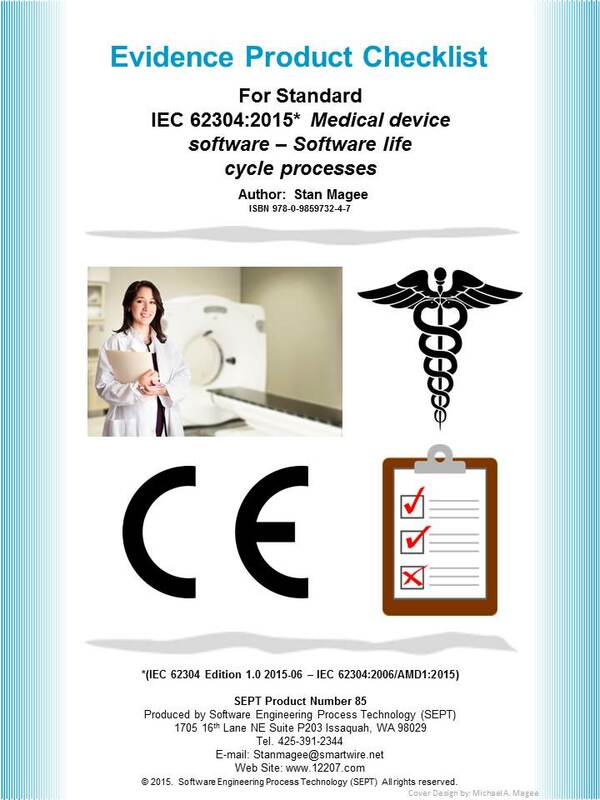 This standard goes much further than ISO 9001 in requirements for documentation; and represents a major change in concept, being a "stand-alone" quality system standard for medical devices. The Checklist clarifies what is required for compliance by providing an easy-to-use product evidence list that will assist any organization to meet the requirements of this important standard. Every Checklist comes with four hours of free consultation. SEPT will answer any question concerning the standard or Checklist for 60 days after purchase..
New! Order the "Self-Extracting File Format" option to get this product in an editable Microsoft Word document!. Now! 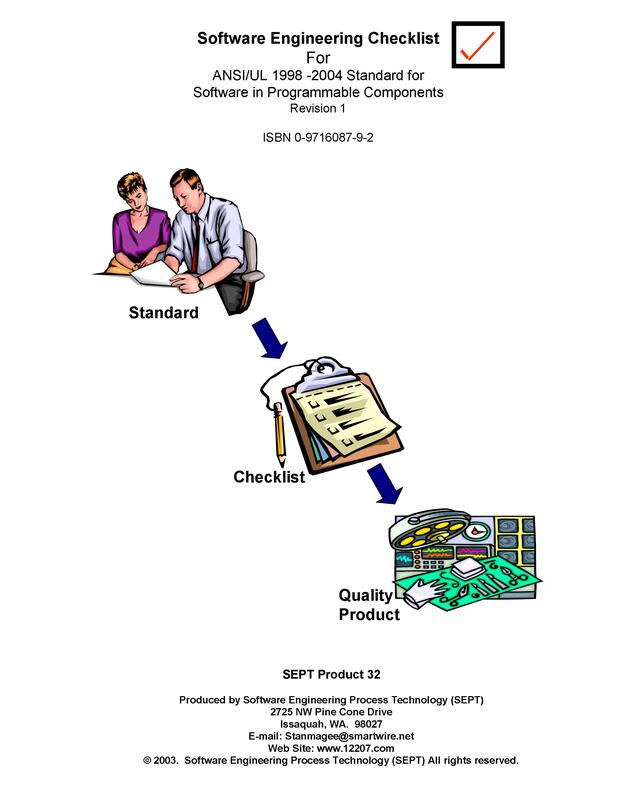 The experts at SEPT have revised this checklist to reflect revision 1 to this major software engineering document: ANSI/UL 1998 Standard for Software in Programmable Components. This standard is used by the fuel cell and medical device business community. The ANSI/UL 1998 standard is focused toward application-specific, non-networked software in a programmable component embedded in a product for which a failure may result in injury to persons. In addition, ANSI/UL 1998 is a reference software standard intended to be used in conjunction with any product specific safety standards that address safety requirements for the identified programmable component and the product hardware. A general software configuration of a microprocessor based programmable component typically includes the operating system or executive software, communication software, micro-controller, input/output hardware, and any generic software libraries, database management or user interface software. The Checklist provides an easy-to-use classification scheme of physical evidence comprised of policies, procedures, plans, records, documents, audits, and reviews. The Checklist clarifies what is required for compliance though a product evidence list that will assist any software organization in meeting the requirements of this standard. Use of the Checklist will save time and money, and may aid in meeting certain governmental requirements. A quality software engineering aid at a reasonable price! New! Order the "Self-Extracting File Format" option to get this template in as an editable Microsoft Word document! 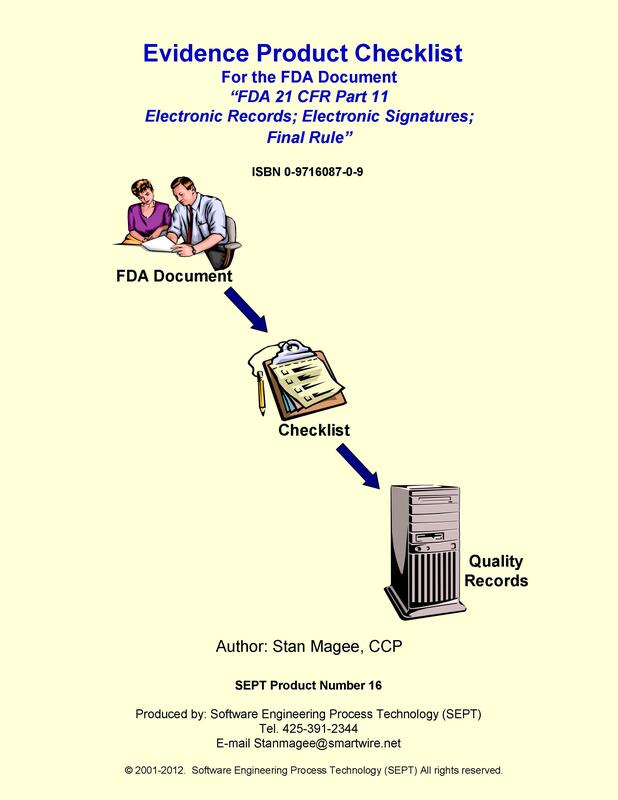 Checklist for the FDA Document: "FDA 21 CFR Part 11 - Electronic Records; Electronic Signatures; Final Rule".The Checklist uses a classification scheme of physical evidence comprised of procedures, plans, records, documents, audits, and reviews. It identifies over 50 pieces of physical evidence. This checklist clarifies what is required for compliance to this standard by providing an easy-to-use product evidence list that will assist any software organization in meeting the requirements of this standard. The Checklist is a quality product at a reasonable price! Download a sample of the new checklist (PDF format). 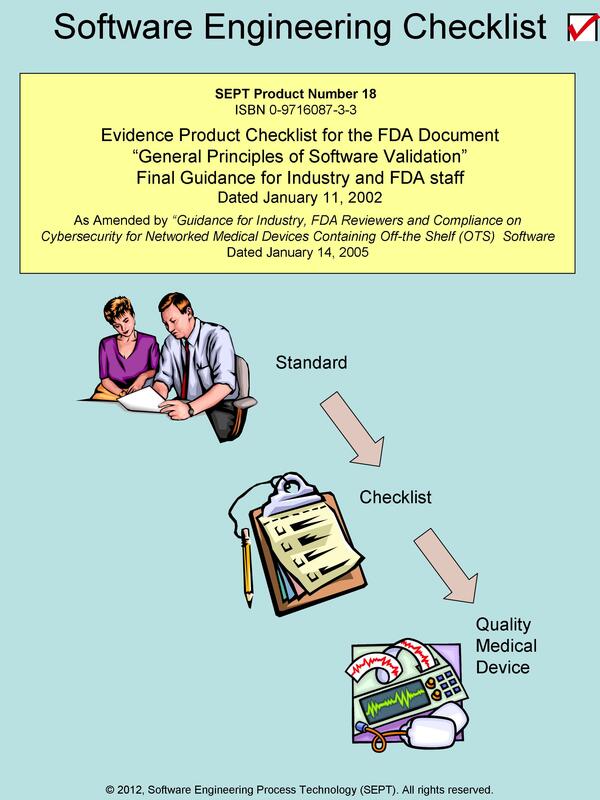 Checklist for - FDA, General Principles of Software Validation Final Guidance for Industry and FDA staff. (Release date January 11, 2002), as amended by “Guidance for Industry, FDA Reviewers and compliance on Cyber security for Networked Medical Devices Containing Off-the Shelf (OTS) Software, January 14, 2005. Now! The experts at SEPT have produced a checklist for this major software engineering standard: General Principles of Software Validation" - Final Guidance for Industry and FDA staff. The Checklist uses a classification scheme of physical evidence comprised of procedures, plans, records, documents, audits, and reviews. The Checklist clarifies what is required for compliance by providing an easy-to-use product evidence list that will assist any software organization in meeting the requirements of this guide. Every Checklist comes with four hours of free consultation. SEPT will answer any question concerning the standard or Checklist for 60 days after purchase. Use of the Checklist will save time and money, and may aid in meeting certain governmental requirements. The Checklist provides a quality product at a reasonable price! 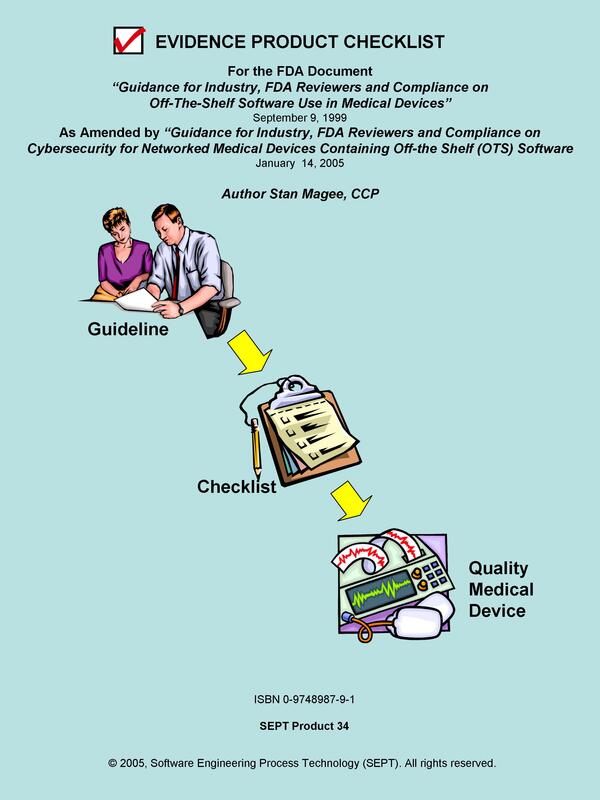 The experts at SEPT have updated Guidance for Industry, FDA Reviewers and Compliance on Off-the-Shelf Software Use in Medical Devices to reflect the suggested compliance with the document Compliance on Cyersecurity for Networked Medical Devices Containing Off-the Shelf (OTS) Software dated January 14, 2005. This checklist reflects these new requirements. The Checklist provides an easy-to-use classification scheme of physical evidence comprised of procedures, plans, records, documents, audits, and reviews. The Checklist clarifies what is required for compliance through a product evidence list that will assist any software organization in meeting the requirements of this guideline. A quality product at a reasonable price! Checklist for - FDA, Guidance for the Content of Pre-market Submissions for Software Contained in Medical Devices. 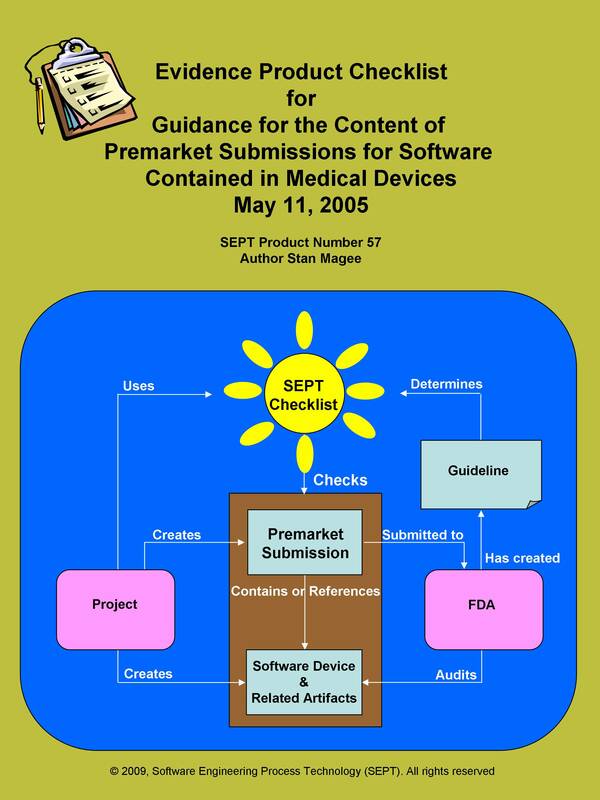 SEPT has produced a checklist for the FDA Guidance for the Content of Pre-market Submissions for Software Contained in Medical Devices May 11, 2005 document This is a "must have" for all quality managers and engineers involved in this FDA document. The Checklist uses a classification scheme of physical evidence comprised of procedures, plans, records, documents, audits, and reviews. This standard calls out or suggests over 120+ items of physical evidence. The Checklist clarifies what is required for compliance by providing an easy-to-use product evidence list that will assist any organization to meet the requirements of this important standard. Every Checklist comes with four hours of free consultation. SEPT will answer any question concerning the standard or checklist for 60 days after purchase.